Glutamate is a type of brain chemical called a neurotransmitter, which means that it helps transmit messages around the brain. It's normally involved in learning and memory. Glutamate is also involved in numerous neurological diseases. Glutamate performs some necessary functions in your brain. It's considered an excitatory neurotransmitter, which means it stimulates areas in the brain or other parts of the nervous system. That type of stimulation is an essential part of the learning process, so in that way, glutamate is a good thing. However, lots of glutamate isn't necessarily something you want. In some cases, it can become what's called an excitotoxin. "Toxin" is rarely a good word, and it certainly isn't positive in this case. In its role as an excitotoxin, glutamate can overstimulate your brain cells. Cells in our body die all the time, and most of them can be replaced. The ones that glutamate drives to suicide, though, are neurons. Your brain can't make new ones to replace the ones that are lost, so it's important to keep them healthy and safe. Glutamate's role as an excitotoxin is believed to be involved in a variety of neurodegenerative disorders such as multiple sclerosis, Alzheimer's disease, and amyotrophic lateral sclerosis (ALS or Lou Gherig's disease). Glutamate dysregulation is also thought to be an aspect of fibromyalgia and chronic fatigue syndrome, even though these conditions are not considered neurodegenerative. Research shows that people with fibromyalgia have abnormally high levels of glutamate in an area of the brain called the insula or insular cortex. The insula is highly involved in processing both pain and emotion. The high glutamate levels are an indicator that this region of the brain may be chronically overstimulated in this condition. In fibromyalgia, sensory input may be heightened, leading to overstimulation. Anxiety is a common symptom/overlapping condition. Motor skills may be impaired, leading to balance problems and falls. Eating disorders may be more common in people with fibromyalgia, as well. Glutamate is present in areas of the body outside of the nervous system, where it functions as a hormone. In this role, it can cause pain. A 2016 study suggests that exercise may decrease glutamate-related pain in people with fibromyalgia, which may help explain the poorly understood connection between this condition and exertion. Studies are divided as to whether glutamate dysregulation plays a role in chronic fatigue syndrome, a condition that also involves sensory overload, anxiety, and movement/balance problems. In contrast to fibromyalgia, though, studies suggest that glutamate levels may be low in some regions of the brain. That makes sense when you consider the brain fog associated with this disease, which includes problems with learning. We also have some evidence to suggest that chronic fatigue syndrome may involve genes that are related to glutamate dysregulation. 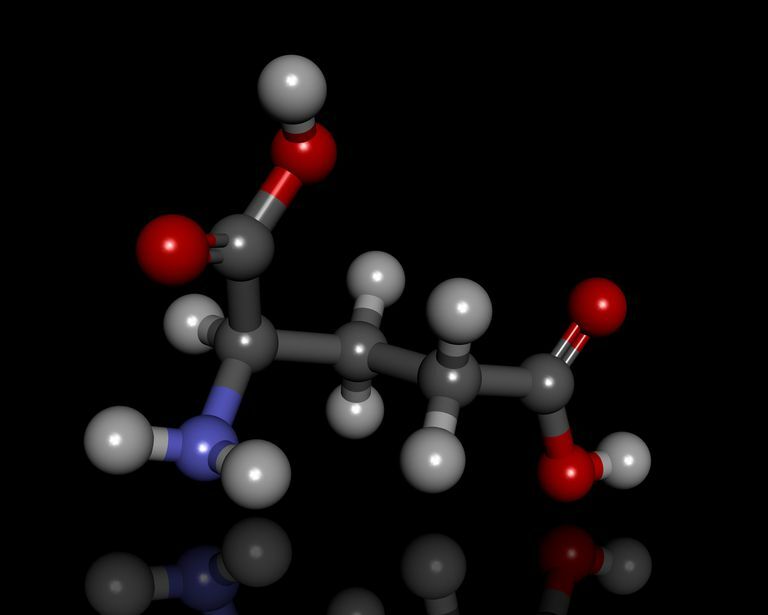 As an amino acid, glutamate is a component of monosodium glutamate (MSG), which is used in some medications and as a food additive. It may be related to some negative health affects. Some health-care practitioners believe MSG can be harmful to people with fibromyalgia, while others believe it is not. Some people say that eliminating MSG from their diets has helped alleviate symptoms of fibromyalgia and chronic fatigue syndrome, but these claims are not substantiated by medical science. You may be wondering how your brain deals with high levels of glutamate. It has a solution—another neurotransmitter called GABA. GABA's job is to calm your brain after glutamate gets it all riled up. It's important for GABA and glutamate levels to be in balance with each other, but that's often not the case in glutamate-related illness. Other neurotransmitters involved in these conditions include: serotonin, melatonin, norepinephrine, dopamine. Hannestad U, Theodorsson E, Evengård B. International journal of clinical chemisty. 2007 Feb;376(1-2):23-9. beta-Alanine and gamma-aminobutyric acid in chronic fatigue syndrome. Harris RE, et. al. Arthritis and rheumatism. 2009 Oct;60(10):3146-52. Elevated insular glutamate in fibromyalgia is associated with experimental pain. Kuratsune H, Yamaguti K, Lindh G, et al. NeuroImage. 2002 Nov;17(3):1256-65. Brain regions involved in fatigue sensation: reduced acetylcarnitine uptake into the brain. Martins DF, Siteneski A, Ludtke DD, et al. Molecular neurobiology. 2016 Sep 13. [Epub ahead of print] High-intensity swimming exercise decreases glutamate-induced nociception by activation of g-protein-coupled receptors inhibiting phosphorylated protein kinase a.
Smith AK, Fang H, Whistler T, et al. Neuropsychobiology. 2011;64(4):183-94.Convergent genomic studies identify association of GRIK2 and NPAS2 with chronic fatigue syndrome.